Did she even know that her former mentor had secretly been working for the Soviet Union? Or that her assistant in pre-war Poland was in fact a Comintern agent? And what about the KGB’s suspicions that she herself was all along working for MI6? Clare had an uncanny ability to appear on the front lines of world events - her life reads like an encyclopedia of 20th Century Warfare. From witnessing the first aerial bombing against England in the Great War, through Hitler's Blitzkrieg into Poland, Clare’s résumé includes the desert war in North Africa, civil war in Greece, terrorism in Jerusalem, and guerrilla warfare in Vietnam and the jungles of Borneo. The story is however about both love and war. We learn of the fiancée whom Clare abandoned in the 1930s, the husband she ultimately left to go off and report the war, and the husband she rushed back to, from the battlefields of Vietnam, but who died on her return. Clare never married again, and promptly flew off to cover an outbreak of fighting in Algiers. More than anything, it becomes clear, she was married to journalism. Here at last is the full story of Clare's century-long journey from rural England, through wars and revolutions, to Britain's final “End of Empire” in Hong Kong. "A gripping account of a restless life that also illuminates profound social changes." "The story of how Clare Hollingworth achieved her great scoop, the outbreak of World War Two, during her first week as a journalist is well known, but it is always worth telling again, especially when it is done with such verve and skill as it is by Patrick Garrett." "The list of her assignments reads like a potted history of warfare, espionage and terrorism…she emerges in Garrett’s book as a rounded personality…The story of her life is a kaleidoscope of world events, shot through with determination and courage. It’s a great read." "The list of her assignments reads like a potted history of warfare, espionage and terrorism...she emerges in Garrett's book as a rounded personality...The story of her life is a kaleidoscope of world events, shot through with determination and courage. It's a great read." A cache of mysterious old documents discovered by author Patrick Garrett will feature in a Special Antiques Roadshow – ‘Pioneering Women’ – on BBC at 8pm on Sunday June 10th. The documents belonged to the celebrated War Correspondent, Clare Hollingworth, and proved to be the impetus and inspiration for Patrick’s biography of Hollingworth, “Of Fortunes & War”, published last year. The programme was filmed in the Houses of Parliament, and is timed to celebrate a century since women secured the vote in the UK. Of Fortunes and War, has been optioned by Eclipse Films. Two Roads have bought World English rights in Of Fortunes and War a life of the veteran war correspondent, who has just died at 105, written by her great-nephew. 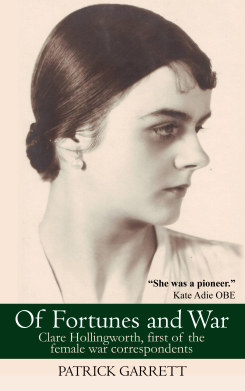 Patrick Garrett has given a fascinating interview to Womanthology, on his great aunt Clare Hollingworth, the subject of his book Of Fortunes and War. As most will be aware, this week brought the sad news of the passing of the great Clare Hollingworth, recently memorialised by Patrick Garrett in Of Fortunes and War. There’s yet another terrific review for Patrick Garrett’s fascinating biography of journalist Clare Hollingworth in the current edition of The Oldie. Patrick Garrett’s fascinating biography of journalist Clare Hollingworth continues to generate huge media interest, with a long piece in the current issue of Time Magazine. There’s a terrific review for Patrick Garrett’s fascinating biography of journalist Clare Hollingworth in The Correspondent. There’s an interesting interview with author Patrick Garrett on his new biography of war reporter Clare Hollingworth in the Deutsche Welle this week. 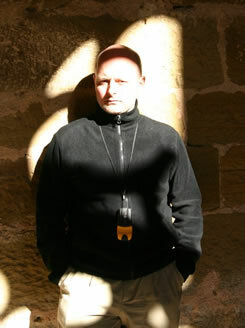 We are in the midst of an age of upheaval, marked by international crises. Does Hollingworth continue to observe these developments, despite her advanced age, and if so, how does she view them in light of her experiences? Clare is a few weeks away from her 105th birthday, and she is now quite frail. Long ago she researched many of the themes that are only now achieving major prominence. [Republican presidential candidate] Donald Trump is suggesting that the US should abandon its NATO allies: This was an angle that Clare followed up in the 1960s. Clare was in Israel when the state was founded and all over the Middle East during World War II. Religion-focused terrorism was a subject she wrote about and in fact was attacked for by academics. Some of her remarks have proved sadly prescient. She wrote about how effective the foot soldier could be against a superpower using the simplest tactics: We see that, too, in the Middle East. Based in China, she wrote about potential tensions in the South China Sea and Pacific long before they were daily news fodder. As for watching today - she still likes to feel that she is part of the news world and insists on keeping her passport by her bedside and her shoes beside her bed in case she is called out to cover a story. Obviously that isn’t going to happen anymore, but it was what gave her a sense of purpose, and is perhaps one reason for her longevity. Patrick Garrett’s terrific new biography of journalist Clare Hollingworth, Of Fortunes and War, has received a great review in the South China Morning Post. Patrick Garrett has written a very interesting long piece in the Telegraph on his new book Of Fortunes and War, a biography of pioneering journalist Clare Hollingworth. There’s an interesting piece in The Courier today on Patrick Garrett’s new biography of journalist Clare Hollingworth. Clare Hollingworth’s life story attracting considerable interest with two million page impressions in last week of coverage. Smithsonian Magazine is latest to say it would make a good film.